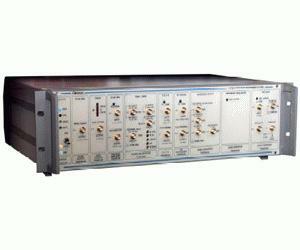 The modular design of the PN9500 issued from the PN9000 product line provides versatility and flexibility to set up the appropriate configuration to measure any kind of frequency source from 2 MHz to 140 GHz. The PN9500 is the only available system capable of measuring state of the art phase noise up to 500 MHz offset. But this feature is not the only unique feature of this RF & MW test set. The Digital Spectrum Monitoring function now offers the PN9500 much more than traditional phase noise measurements. In fact the PN9500 already integrated a frequency counter, a digital oscilloscope, a power meter and now integrates one of the best RF tools, a Digital Spectrum Monitoring function. Not only can the user perform narrowband spectrum analysis but they can also select to measure wideband spectrum into the DC to 18 GHz range. The monitoring function can be specified into a very flexible range. As for a traditional spectrum analyzer, this function measures power level, power variations, ACPR, Harmonic distortion and more by setting markers. The DSM software also allows exporting of text files or pictures in various formats for post-processing or storage in third party software. This new option also guarantees a better Return On Investment for the owner as the Spectrum Monitoring function uses hardware parts usually dedicated to phase noise measurements. DSM is a software option available for all PN9500 systems as an upgrade or an option in a new unit. In addition to the standard functions usually present on spectrum analyzers, the DSM also integrates specific processes well adapted to the RADAR market. In the case of a pulsed signal, it measures the spectral response of a pulsed signal and analyzes the power difference between the side lobes. This analysis is done with a 30 MHz maximal span.